Here's a little recipe which I found on www.101cookbooks.com. a while ago. I've adapted the original recipe and it's now gluten free! These are tasty,crunchy breadsticks which have a wonderful nutty flavour. Use them instead of serving crisps (much much healthier) or serve them with dips or with home made soup. They are easy to make and you can knock up a batch in no time. And....they make great little broomsticks too, so a perfectly spooky halloween treat. Preheat oven to 450 F or 220 C.
In a medium sized bowl combine the buckwheat flour, gluten free flour and salt. Mix gently with a fork and pour this into the bowl of a food processor. Add the butter cubes and pulse briefly until the mixture looks like breadcrumbs. Pour the mixture back into the bowl and add the grated cheese and rosemary. Mix through. Add the iced water and mix with a fork until the dough comes together. Knead gently to make a dough, but don't overdo it or you'll end up with a greasy lump of dough. Pat the dough out into a circle, wrap with clingfilm and place in the freezer to chill for about 30 minutes. The dough will be fine in the freezer for a couple of days. When you are ready to make the dough, cut the disc in half and keep the other half cold in the fridge. Make sure the oven is really hot. Roll out the dough to about 3/4 cm and then cut into 1 cm strips using a sharp knife. Pinch the dough together and then roll lightly on a lightly floured board. Place the breadsticks on a baking sheet as you go along and make sure they are all equal in width and length so that they bake evenly. Don't worry if the dough breaks up a bit, just pinch it back together and roll it out again. If the dough starts to get too soft and difficult to work with then put it back in the freezer for a few minutes to harden up. Bake the breadsticks in a hot oven for about 8-10 minutes. Leave them to cool before serving. You can substitute other herbs for the rosemary such as thyme, oregano or even lavender. You can also trry using different cheeses like Emmental, Gruyere or Parmesan. 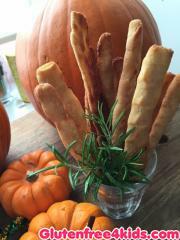 I made these yesterday with a combination of rosemary and lavendar in the dough. The raw dough tasted far more cheesey and herby than the cooked sticks but it wasn't overpowering in the cooked version, which were delicious and went down a treat with my family. Very easy to do although I let my pastry get too warm when I was rolling them up so they spread round the baking tray and stuck to each other a bit. (Adriana diagnosed the problem - thank you!) Next time I might put them in the fridge for a bit before cooking if I think I've played with the dough too much. If you want to try a delicious dairy free version of these straws substitute the butter with a good quality margarine or similar vegetable oil based product. Use something which has the consistency of butter, not the spread versions which will have too much water in them. Also substitute the cheese with a handful of chopped olives and about 4 or 5 sunblushed tomatoes, finely chopped. Make sure you drain off as much oil as possible and pat them dry so as not to make the dough too wet. You may also add a little less water then stated in the recipe as the olives and tomatoes will add a lot of moisture to the dough. You can stick with the fresh herbs (rosemary or thyme) but perhaps, skip the lavendar,as this might be overkill. Add the olives and tomatoes when the recipe indicates adding the cheese and then proceed as normal. You may want to bake these for a little longer than stated, so you end up with crispy straws. A big thank you to Lucy who recently attended the gluten free cookery session at Leith's and allowed me to 'experiment' on her and to Max at Leith's who saved the day! It's great to discover new things and a great joy when you meet people who are adaptable and eager to have a go. And by the way,,,,,these really are delicious, so even if you are not dairy free, have a go!